Sometimes, a girl just wants a sweet and salty snack to munch on. 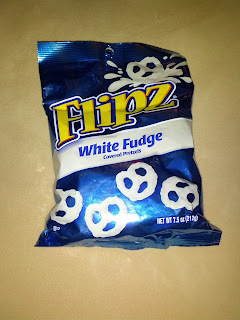 When I passed by the Flipz white fudge coated pretzels, I couldn't resist. Why am I on such a snack food kick these days? My initial review of these was not good: the pretzels were pretty generic, a bit of salt on them. The white fudge coating was kinda waxy and uninteresting, just sweet. They met my desire to have something munchy, but not really the sweet and salty combo I was looking for. I would not get again. As I mentioned a few weeks ago, GoPago gave out a special $5 credit for Valentine's day. While I squandered my credits on treats for myself like donuts and sweet drinks, Ojan used his to get real food. 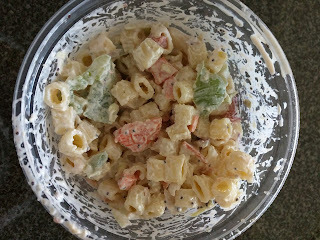 We've been enjoying a lot of prepared salads lately, like potato salads, macaroni salads, and coleslaws, so I was excited when I saw the slew of salads offered at Deli & ... and told him we should order some for an easy dinner. He agreed to share with me, and let me pick the salads. I win! Anyway, they had a slew of great sounding salads, including "Bombay curried chicken" and "tarragon chicken". But the ones that caught my eye were the country potato and macaroni as I've had a thing for these types of salads lately. I couldn't decide between them, and had no idea how big a "small" or "large" were, so I didn't want to order both. When I saw that they were the same price, I decided to order the potato salad, but put in the special comments that I'd like "half potato salad, half macaroni salad". I figured that if they wouldn't do a mixed container, or didn't see the note, I'd still be pretty happy. We quickly got the confirmation notification, but then the GoPago app notifier popped up again. Uh-oh. It was Deli & ..., telling us that they were out of potato salad, and asking if all macaroni was ok instead. I loved that they checked with me before proceeding. I hesitated, bummed about the potato salad, and decided to push my luck and ask for half coleslaw. I'm really so bad at settling on just one thing! They quickly replied again, saying sure. The entire back and forth was so easy, and it was my first time I had this sort of interaction via GoPago. Both the special instructions area and the back and forth messaging with the business are great features. GoPago is doing a great job here. The order was ready the moment I walked in, waiting at the register. Have I mentioned how easy and convenient GoPago is? Seriously, I love it. 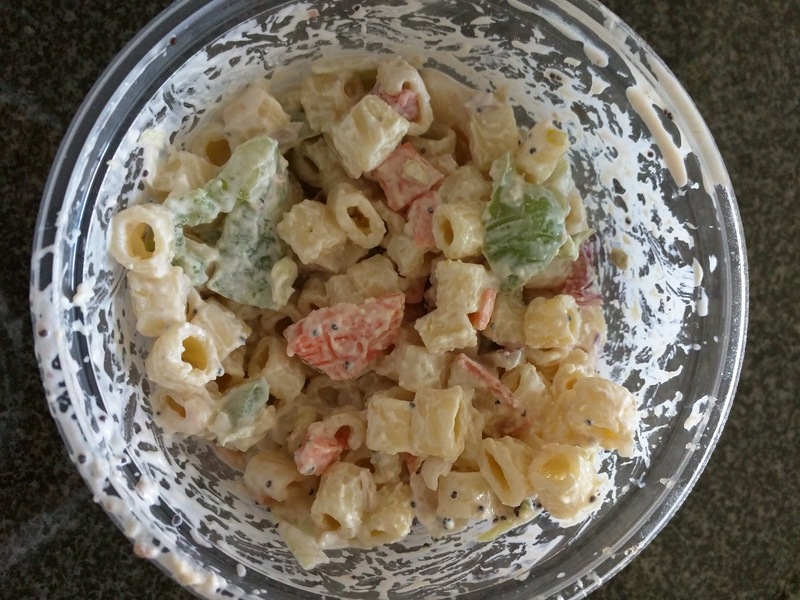 1/2 macaroni salad and 1/2 coleslaw. Small. $2.95. I opened the container and found the coleslaw on top. It was an interesting slaw, with crispy cabbage chunks of assorted sizes, all much larger than you find in standard slaw. I really liked that, and appreciated how fresh and crunchy the cabbage was. The surprising thing was the dressing, it seemed to be poppyseed based. There were also some raisins in the mix. It was decent slaw, but it didn't have as much flavor as I expected. I actually think it was the addition of the poppyseeds that set my expectations that it would have more going on. If it instead looked like standard coleslaw, I wouldn't necessarily expect it to be that flavorful. Under the slaw was the macaroni salad. It was made up of small tubes, rather than traditional elbows. There was also chunks of crispy green peppers, carrots, and sliced green onions. 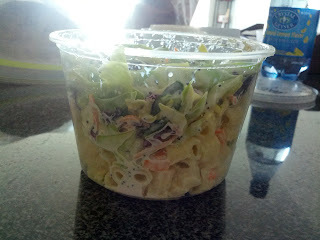 The pasta was decently cooked, but like the slaw, it just didn't really have much going on in the flavor department. I again noted and appreciated the fresh crispy vegetables. This stuff hadn't been sitting around for ages. It was creamy, mayo based, but not overdressed like the version I had from A.G. Ferrari. I ended up mixing in some of my mom's homemade zucchini relish, and it was exactly what it needed. It added a bit of kick, and I really really enjoyed it that way. I feel a bit like one of the people on those cooking shows who hammers on about knife cuts, but, well, the veggies in here were a bit ridiculous. Some huge chunks of peppers, some large carrots, some tiny. Just all different sizes, no consistent shape, totally all over the place. Last week, I was back up in Tahoe for a few days. You may recall that besides the hotel breakfast buffet, I was incredibly disappointed by all of the dining out I did on my last visit, so this time, I didn't even bother trying to go out while I was there, and instead choose to just cook at the lovely cabin we rented. But, I also researched a bunch of places between San Francisco and Tahoe, as it is more fun to stop for a meal halfway than drive the entire 4 hours in a single stretch. Last time, we stopped for lunch on the way there at a super cute French bistro in Sacrement, and had good house smoked salmon and absolutely perfect crème brûlée, but I didn't take photos or take notes ... whoops! Anyway, this time, I was prepared. I researched all the lunch places in Auburn, Roseville, Davis, Sacramento. And one place kept catching my attention: Joe Caribe Bistro and Cafe. A Caribbean restaurant, known for their fish tacos, but they also have a slew of other dishes like burritos and curries. And I literally wanted every single item from their dessert menu! It sounded like the perfect fit: casual, so we didn't need a reservation and could show up when we got there, since out timing would be based on traffic. A full service restaurant, so we could take a real break from the road, but it wouldn't be a really long meal, as we did want to get back. Lcated directly off of I-80, so we weren't going out of the way. Since I thought some of our other friends would be stopping with us, it also had a menu that would please everyone, including vegetarian, vegan, and gluten-free options. We left Incline Village around 11am, putting us in Auburn right at 12:30pm for lunch. Perfect timing! The restaurant was much larger than I expected, with a bar, regular tables, booths, and several private rooms. There was even a table in a window with floor cushion seating! The tables were covered with very bright yellow plastic tablecloths with bright colored fruits and flowers, that sound totally tacky, but really weren't. The space was all decorated in a similar style, with bamboo accents on the room dividers, strands of colored lights hanging from the ceiling etc. Again, I know it sounds like it would look cheap or silly, but it wasn't, and was a really great vibe! The music matched the overall atmosphere. The service was very friendly. Our waitress was enthusiastic and I loved her catch phrase of "you've got it!" as a response to most requests. The food was good, and I recommend it as a stop for anyone driving to/from Tahoe! 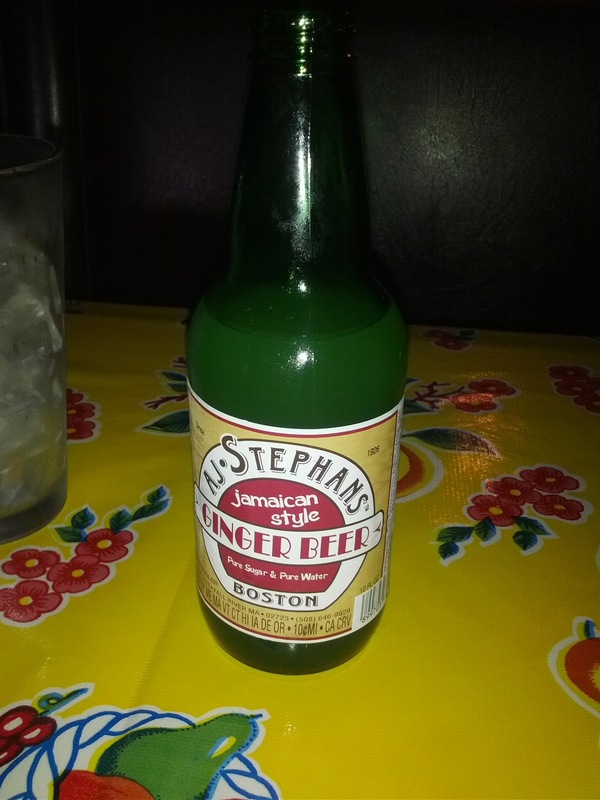 AJ Stephans Jamaican-style Ginger Beer. $3. One thing that caught my eye while I was researching Joe Caribe was their selection of ginger beers. Since Ojan is not able to drink alcohol, he discovered ginger beer, but few places have much selection, and many are often just sugary. Joe Caribe offered up at least 5 different varieties, only one of which we'd seen before. He was excited to try one out, so asked for a recommendation for one that wasn't too sweet. The waitress suggested two that were supposed to be spicier. One was listed as from the US, and the other, Jamaica. Wanting to try the most interesting one he could, Ojan went for the Jamaican. We were a bit surprised when the bottle arrived on the table, proudly proclaiming that it was made in Boston. Ojan and I are both from the Boston area, so this was far from exotic, but we were still exited to try it. It was indeed very spicy, almost too spicy. It complimented the food well, but I think it would have been too much to just drink on its own. Perhaps over ice on a really hot day it would have been nice. The strange thing is that we didn't really taste that much ginger. Upon looking at the ingredients list, we discovered that it was made from water, sugar, and "flavors". Ginger was not an ingredient! This was pretty disappointing, and we did feel like we were led a bit astray, as he was specifically looking for one that was more ginger and less sugar, and this was just flavored sugar water. And uh, it was NOT from Jamaica! I still give them credit for the great selection of ginger beer, and $3 for a unique bottle was a fair price. 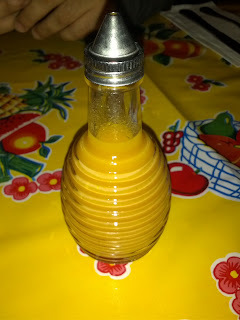 On each table, along with salt and pepper, is their signature habanero sauce. My entree was so well seasoned and spiced that I didn't need it, but I added it to some rice just to try it. It was decently spicy, and I could imagine happily adding it to other dishes, but mine really didn't need it. 2 Taco Plate: Fish taco, shrimp taco, black beans, rice, pickled carrots. $9.95. When you pull up outside Joe Caribe, there is a sign just as big as the one with their name on it that proclaims "Fish Tacos". And of course, my research revealed tons of people raving about the fish tacos. And, as you may have noticed from all my Rubio's posts, I've had a serious thing for fish tacos lately. Thus, I had to order the fish tacos. The tacos are available as a pair a la carte, or as a platter for $2 more, with beans, rice, and pickled carrots. I don't generally care much for rice and beans, but so many reviews raved about the pickled carrots, that I decided to go for the full platter. Along with the fish tacos, they also offer shrimp, pork, or chicken. Being my indecisive self, I couldn't stand just getting to try one thing, so I ordered one with fish, and one with shrimp, even though the split choice wasn't listed on the menu. Thank you Joe Caribe for accommodating this! The pickled carrots were shredded pieces of carrot, not what I was expecting, but the form was perfect for mixing with other things on the plate. They had a gingery flavor to them, and were very intense. I found that they posted the recipe here, if you want to make them yourself. The beans were whole black beans, perfectly cooked, not at all mushy, not too firm. They were nicely seasoned as well. As I've mentioned before, I don't care for beans generally, but these were really well prepared. The rice was equally well executed, moist, not mushy, not crunchy, and again well seasoned. Another side that I'm not generally a fan of, but I could appreciate the quality preparation. The beans, the rice, and the carrots really rounded out the platter nicely. And finally, the tacos. At first glance, they looked the same, and I thought my mixed order was lost. Indeed they were very similar, with identical fillings besides the different proteins. Both were served in warm, slightly toasted, corn tortillas, a double layer. I liked how they were a bit crispy on the outside, and the corn flavor was good. Not extraordinary tortillas, but very solid. 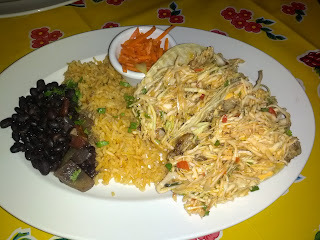 The tacos were topped with "island slaw", a crispy, flavorful slaw mixture, that really filled up the large size tacos. There was a lot of it, but I really liked it, and would gladly have just eaten the slaw as a side too! The tacos were so overstuffed that a lot of the slaw came spilling out, and I enjoyed it with the rice and beans. Such good flavor and texture combinations. They both also contained a lot of rémoulade. It oozed out all over the place as I bit into the tacos. I love mayo and creamy sauces on my tacos, so I really liked the rémoulade, but I was a bit surprised to find it on the fish taco. The fish taco was described on the menu as "fish with allspice and lime". When I asked for more details, I was told that it was simply grilled Pacific cod, a really light and healthy dish. So I was surprised when taco arrived with a ton of rémoulade in it. The rémoulade is included in the menu description of the shrimp taco, so it seemed weird to tout the fish as a light dish, and yet be filled with mayo based dressing. Perhaps she meant it as opposed to being a breaded and fried fish? Anyway. The fish came in small chunks, all with nice grill marks. But ... the first bite I had was very, very fishy. I did not like it at all. I was actually so put off by it, that I picked all the fish out, and just enjoyed my slaw and rémoulade taco (which, was really quite good, and plenty full and big without the fish). At the end, I did try one more bite of the fish, and that one wasn't fishy, so hopefully I just got one bad chunk? I liked the other components of the taco, but the fish was ruined for me. I didn't taste the lime at all, and I think it would have been great with a bit more acid in it. Joe Caribe isn't the sort of place to have a condiments bar, but if they did, and they had limes or lemons, I'd definitely squeeze some more acid onto the taco. The shrimp taco was more successful. Described as "shrimp sautéed with garlic, smoked paprika, and served with rémoulade". It was the same as the fish taco, except with shrimp in place of the fish. The shrimp were nicely cooked, not rubbery, and there was a generous amount of them. This was a very large plate of food, and the $9.95 price was a great value. I can't help but compare this meal to the last few fish and shrimp taco platters I've had at Rubio's, and although Rubio's was slightly cheaper (~$9 for the platter), these tacos were much bigger, with larger tortillas, double shelled, and far more protein inside, the sides were more than double the size, the quality of ingredients seemed higher, and, it was a full service restaurant. Sorry Rubio's, but Joe Caribe wins. Apple Crisp with Vanilla Ice Cream. $5.50. The dessert menu sounded absolutely incredible, loaded with all of my favorites, including a rich chocolate pot de creme with fresh whipped cream, warm bread pudding with rum sauce, coconut panna cotta with mangos ... seriously, some of my most favorite desserts! There wasn't a single dessert on the menu that I didn't want. But in my research, I found very few reviews of the desserts. And I was absolutely stuffed. And Ojan, my dining companion, proclaimed that he'd have at most a bite or two of anything. I was seriously, seriously full, but I couldn't get past the fact that the menu was basically all my dream desserts. So when the server came back to ask if we wanted any dessert, I hesitated. She assured me that all the desserts were amazing, all house made. And she said the magic words, "people love the warm apple crisp, topped with vanilla ice cream". 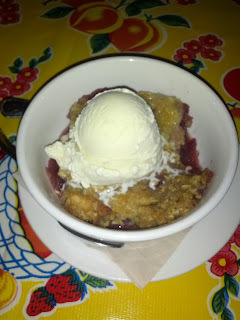 If you've read my blog much, you know that I am a total and complete sucker for warm pie/crisp/cobbler with ice cream. Totally my thing. I still hesitated, and asked how large it was, since the $5.50 price was much lower than I'm accustomed to, so I figured it must be small. The waitress told me that all the desserts were pretty small. So, I went for it. It is hard to see the scale in this photo, but this was most certainly not a small dessert! It could have easily satisfied 3 people. The menu described it as "fresh green apples and blueberries with brown sugar oatmeal topping, topped with Häagen-Dazs Vanilla ice cream". It arrived piping hot. Mega bonus points. I hate it when places say they serve warm pie and it is barely lukewarm. This was not just warm, but hot. I think Ojan may have burnt himself on his first bite, as he doesn't like ice cream with his crisp, so he had nothing to cool it. I was thrilled to have it so warm. The scoop of ice cream on top was large, and when it arrived, had barely started melting, a sign that it was scooped on and promptly delivered to our table. More bonus points! It was just generic Häagen-Dazs, so nothing remarkable, but as I've said a million times, I just love cold ice cream with hot desserts, so I loved having it there to mix in with some bites, and I liked how it pooled up as it melted into the dish. Hot dessert and cold ice cream - they nailed that part! But, the crisp itself wasn't that great. First, it wasn't actually crispy in any way. The topping was an oatmeal crumb topping, that was gummy rather than crispy (and not just where the ice cream touched). I did like the warm oatmeal crumble with the ice cream and some of the fruit, but, a crisp it was not. The main fruit component was thinly sliced apples. The menu said green apples, but I'm not sure they were. I didn't like them at all. They were far too mushy for my taste, and I didn't really like the spicing. There were also some blueberries in the fruit mix, which I did enjoy. Overall, the dessert was nicely balanced, and not too sweet. Sometimes crisps can be far too cloyingly sweet, and the ice cream is needed to cut the sweetness, and that was not the case here. 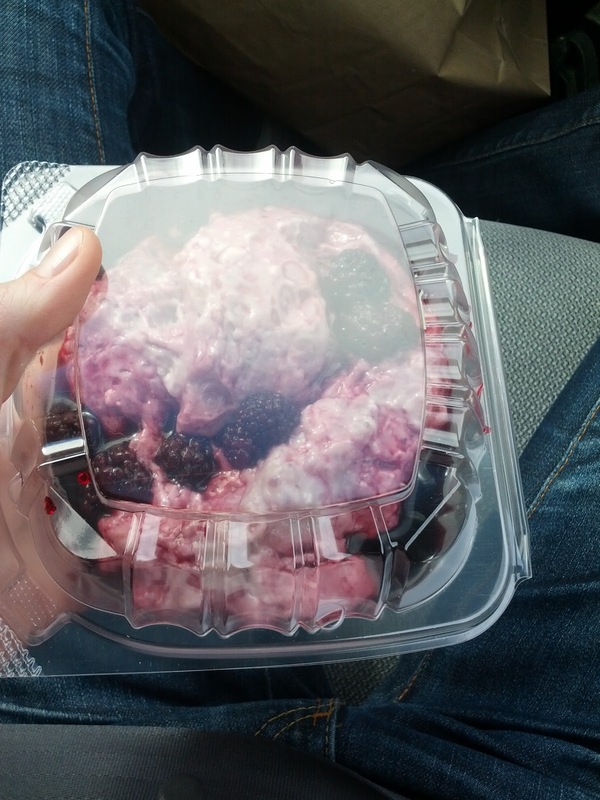 I did enjoy having some spoonfuls of warm oatmeal topping, warm blueberries, and cold ice cream, but I wouldn't get this again, as I didn't like the overall dish. The price was incredible however - the slice of crisp was really insanely large, and in San Francisco, just a slice of crisp like that would easily by $8+, with another $2-3 added on for the ice cream. A really great price! Ok, yes, I'm crazy. Particularly when it comes to desserts. Did I mention that I wanted all of the desserts on this menu? Just picking one ... that is crazytalk. I was seriously wishing that we had gone with a larger group of people to try more desserts, but our travel buddies all decided they wanted to get back to SF sooner, and didn't stop with us. When I was pleading with Ojan to eat dessert, he said I should just get dessert to take with me, as we had a cooler in the car, and I could eat it later. Of course, he meant that I should do that instead of getting it at the restaurant since we were both stuffed, but I obviously couldn't get the hot crisp and ice cream to go, so I had to eat it there. But he had planted the seed of getting something togo in my head, and although I didn't order another initially, I couldn't resist when the waitress came back to check on us. I give her credit for not laughing at me, as she asked how the apple crisp was, and my response was to order yet another giant dessert. I needed to pick one that would hold up to the two hour drive, so the warm desserts and the ones with ice cream were out. Since I love puddings, I was drawn in by the blackberry tapioca. The menu described it as "house made tapioca with fresh blackberries, topped with freshly made whipped cream." I wasn't really sure what that meant. Was it a pudding? Or just tapioca balls topped with fruit and whipped cream? I asked the waitress, and she told me it was large style tapioca pearls. I asked if it was a pudding, and she said yes. It seemed like it would have the best luck of surviving the drive and being delicious in the evening, so I asked for it to go. But do you think I really waited until I got home to eat it? Ha. I needed to at least sample it immediately to make sure I could write a proper review, right? It was not at all what I was expecting. Although the waitress told me it was large size tapioca, they were small pearls. The tapioca and the pudding were about the same consistency, so the pearls were completely lost in the pudding. I would have preferred them to have more chew, something to distinguish from the rest of the pudding. The pudding was ... basically a big gelatinous mass. It really didn't look good. And when I tried a few bites in the car, I really didn't like it. It didn't have much flavor, and it certainly wasn't remotely creamy. I'd barely consider it pudding, it was more of ... hmm, I just don't know. A strangely thick gelatin with some textureless tapioca balls. Not that great. Then there were blackberries, all a bit mushy. I was expecting fresh fruit given the description, but these seemed like perhaps they had been frozen, or at least macerated in some liquid? There was also some very watery blackberry syrup, that leaked out of the container and all over my cooler. Whoops. I didn't get a photo of it, but there was a small container of whipped cream. The waitress asked if I'd like the whipped cream left off since I was getting it to go, and I asked for it on the side. I'm guessing if I had ordered it to eat at the restaurant, that there would have been much more whipped cream. It seemed like far too little for such a massive container of pudding. The whipped cream deflated a bit when I brought it home, but it had a lovely flavor. It was sweetened, but not too sweet, and was really creamy. Very good whipped cream, and it went really well with the pudding. Which brings me to the review of the dessert as a whole. I didn't like any element of this dish (besides the whipped cream), on its own. But, when I got home, put it in a bowl, stirred it up, and plopped the whipped cream on top ... it just worked! I ate a big bowl full. And then, when Ojan said he didn't want any, I had another big bowl full. I loved it. Sure, the pudding was a really strange texture, and it wasn't remotely creamy. But, that wasn't necessarily bad. It was just more like a panna cotta. And yes, I'd have preferred the tapioca to stand out from the pudding, but there are plenty of desserts without that contrast, and once I stopped wanting or expecting it to be that way, I enjoyed it. I think the blackberry flavor and sauce soaked into the pudding more over time, and that really increased the flavor of the overall dessert. And the whipped cream was really just the perfect topping. And again, an amazing price. Seriously, $5 for a giant dessert? Great value. I'd consider getting this again, although I'd really like to try their actual panna cotta, or perhaps the warm bread pudding. I really have to go back next time I'm in Auburn! 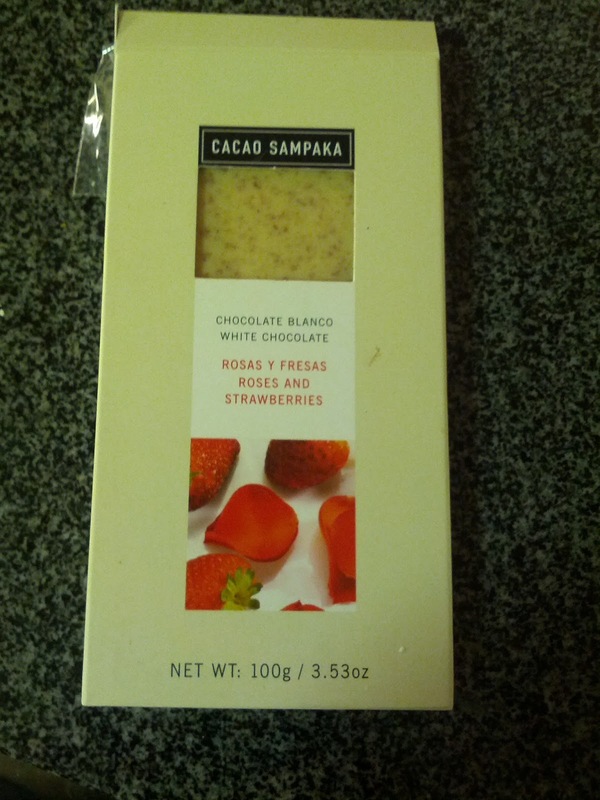 Cacao Sampaka is a Spanish chocolate maker. I found them at my local chocolate shop, intrigued by their white chocolate, of all things. I had been in a bit of a white chocolate mood, and I was curious what a quality white chocolate would be like, as white chocolate doesn't exactly have the best reputation, and I knew if this chocolate shop was carrying it, there must be a good reason, as they carry only the best everything, and I'd never seen a white chocolate in the shop before. 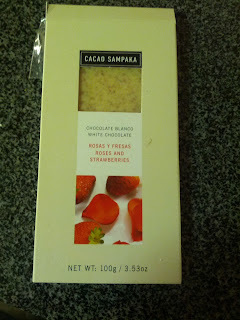 It really was amazing, although clearly in a different category from cocoa based chocolate. The success of the white chocolate inspired me to try several of their other bars as well, but the white was by far my favorite. White Chocolate Tablet with Roses and Strawberries. White Chocolate Tablet with Roses and Strawberries: "White chocolate is expertly blended with rose petals and strawberry pieces for a crunchy, fruity, floral, and delicate flavor." Tasting notes: This was as interesting as I was hoping it would be! No waxy, boring white chocolate here. The rose added a beautiful floral note to it, that you could both taste and smell, but it didn't ever cross over into the soapy realm. The little bits of strawberry added a great little crunch to the otherwise very smooth white chocolate. This was really different, and really quite intriguing. It was delicious on its own, but also paired well with tea. I didn't share this bar with anyone. Loved it. Gin & Tonic Tablet: Milk chocolate. Tasting notes: This was incredibly citrusy. A thin, nice milk chocolate, with intense citrus flavor, in the form of crispies. None of us tasted gin nor tonic however. Xoconusco: Single origin 70% chocolate made from Royal Xoconusco cacao (criollo variety) from Chiapas, México. Tasting notes: no interesting flavors - not much fruit, not bitter, not complex in any way. Very smooth. I found this to be incredibly boring. La Joya: Single origin 70% chocolate from the La Joya Plantation in Tabasco, México. Tasting notes: no bitterness, smooth, subtle spice flavor, better than Xoconusco but still pretty uninteresting. This bar was much lighter in shade than the Xoconusco, even though they were the same cacoa percentage, which lead to it being a little shocking - it looked like it was more of a milk chocolate, so the dark bitterness was a pleasant surprise. Flor de Sal de Ibiza: 67% dark chocolate. Tasting notes: Detected some spice (nutmeg?). Most bitter of the bars we tasted. Nice salty finish. My favorite of their cocoa based bars I tried.